As policymakers ponder whether and how they might be able to do more to encourage job creation, they should keep in mind that the monthly payroll job figures [e.g., -85,000 in December] are the net result of literally millions of hiring and firing decisions each month. In addition to the well-known payroll data, the Bureau of Labor Statistics also provides information about the monthly pace of hiring, firing, etc. Those data, known as the Job Openings and Labor Turnover Survey or JOLTS, allow us to track the overall dynamism of U.S. labor markets and the relative balance of gross job gains and losses. As you would expect, new hires were higher than separations in the middle of the decade when employment was growing. 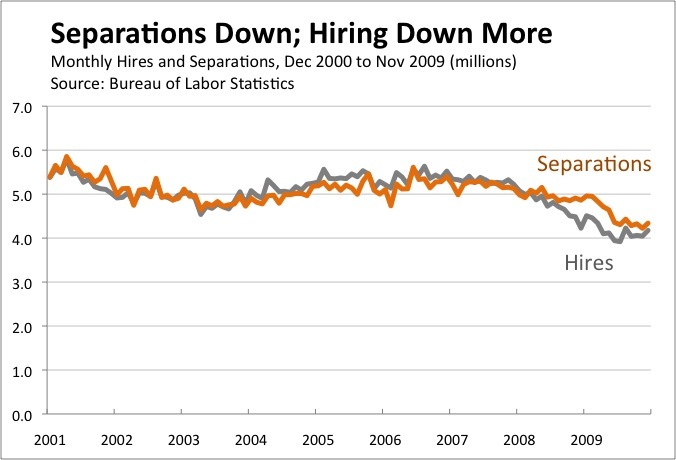 Since the start of the recession, however, separations have outstripped hires by a wide margin. As the chart shows, overall labor market activity has plummeted over the past two years. New hiring has fallen by more than 1 million workers per month. Employers hired more than 5 million new workers each month back in 2007, but have recently been hiring only slightly more than 4 million. Separations show a similar pattern, as about 1 million fewer workers are leaving their jobs each month than did before the recession. 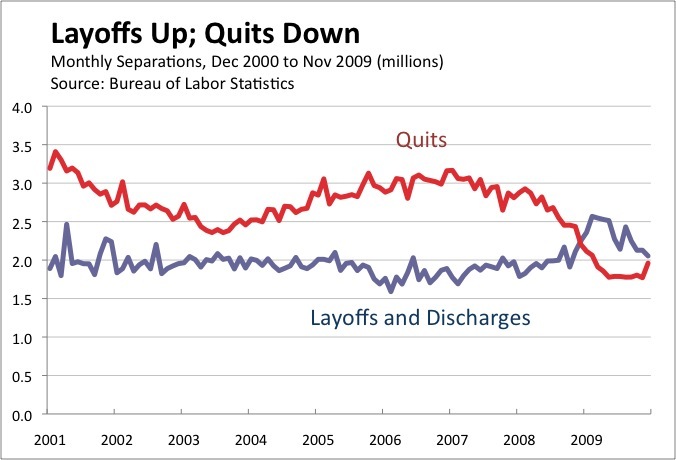 As you would expect, layoffs and discharges increased sharply during the recession. During the depths of the financial crisis in late 2008 and early 2009, an average of more than 2.5 million workers lost their jobs each month. The pace of layoffs has since slowed—about 2.1 million workers lost their jobs in November—but remains above levels consistent with growing employment. Quits, meanwhile, have fallen off a cliff. An average of 1.8 million workers left their jobs voluntarily each month during 2009, about 40 percent lower than the 3.0 million pace a few years ago. In short, many fewer workers are finding opportunities to move to better jobs. The JOLTS data suggest that the pace of quits may be one of the best signs of a healthy labor market. The uptick in November—to the highest level in ten months—is thus welcome and something to keep an eye on in coming months. I have found, similar to your observation, that the best indicator of the health of the labor market is separations minus quits. 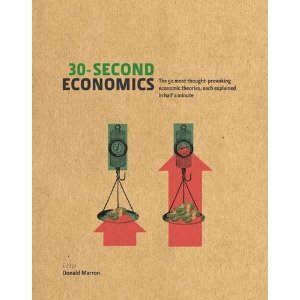 This gives something closer to the more economically relevant involuntary separations. Further, this series is also highly correlated with Shimer’s separations series which has the same dynamics as using the number person unemployed less than four weeks as a percent of the workforce from the household survey. In the past, the latter two series have served as the best timely indicator of turning points in the business cycle. When separations turn sharply up, the recession is beginning. When they fall, the cycle is turning positive. Thanks. I’ll have to take a look at the metric you suggest (number of persons unemployed less than four weeks as a percent of the workforce); that goes back much further in history.